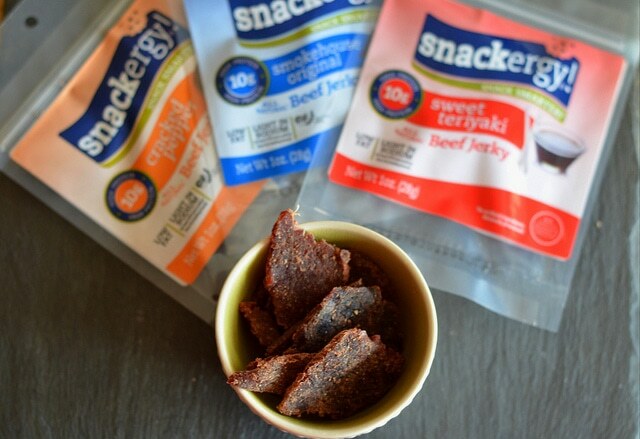 Before we talk about this Snackergy Jerky, a caveat: I’m a big fan of jerky. Big. Huge. I think it’s because, in general, I’m on #TeamSalty. Sweet stuff doesn’t tempt me as much as a good old salty hunk of meat! And my body totally enables this behavior. I have low-normal blood pressure. The only time I achieve a perfect 120/80 is actually when I salt-binge (which I try not to do even though my brain desperately wants to justify it). Which is why I was so excited when Bariatric Choice asked me to review their “Snackergy” line of jerky! Let’s dive right in, shall we? So the review you are getting from me today is my very first impressions of their product. No filter. #Eek. All three of these are beef jerky. Since there are three different kinds, I’m going to point you to their website to check out the full nutrition label but here are the most important parts. A serving of any of the flavors is 1 oz. They have 80 calories per serving, 1.5g fat, 11 total carbs (including 11g sugars) and 10g protein. I know, I know. Just for a bit of research though I looked up the two other types of jerky I frequently eat: (Turkey) Perky Jerky and Ostrim Jerky. 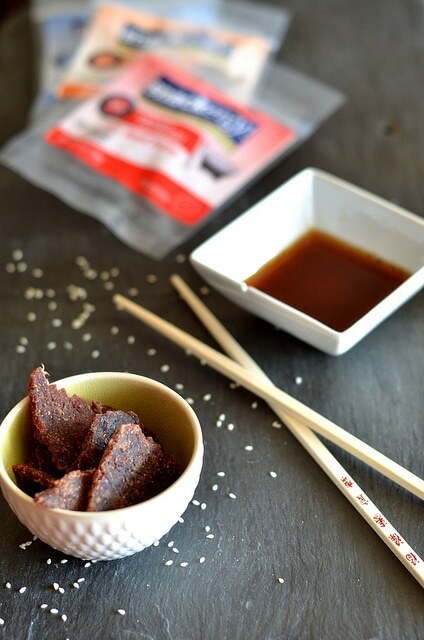 For Perky Jerky (Teriyaki flavor) the sugars are slightly lower at 6g per 1 oz. serving (10g protein). 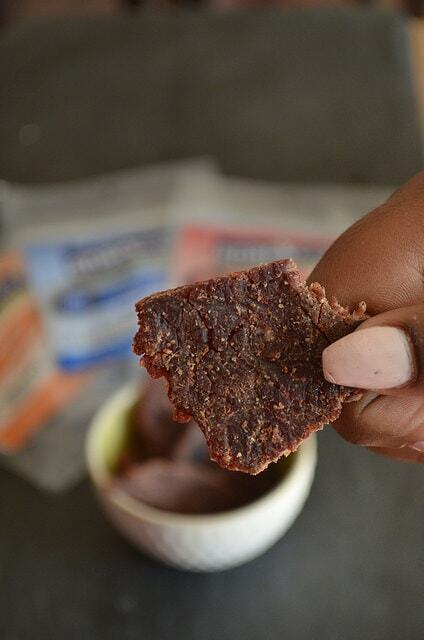 Ostrim has 2g of sugars in each of its jerky sticks (14g protein). So I do have to ding them on that. 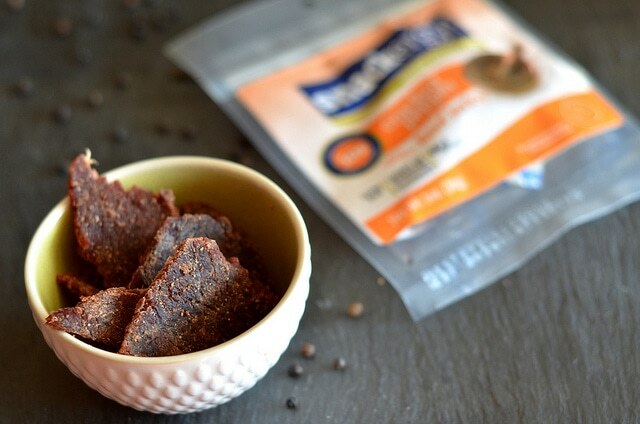 It’s totally possible to make a jerky with less sugar. In the Teriyaki flavored Snackergy jerky, I counted three sources of sugar: brown sugar, honey and pineapple juice. Now those things are likely to be present in most teriyaki flavored things (that’s what teriyaki sauce is made of!) but for those of you who are really sensitive to sugars, just know it’s in there. The protein thing? Meh. Yes, Ostrim has 14g protein per stick BUT that’s because it’s partially made out of ostrich meat, which has more protein ounce-for-ounce than either turkey or beef. I’m not sure if I ever told you this but my youngest daughter (who I have historically called “La Petite Diva” here on the blog – although at 16 she’s not as petite as she was when I started this blog when she was 7!) is also a jerky enthusiast. In fact, she even lent her (well manicured) hand for a shot so you can see the jerky pieces up close. It should also be noted that my boyfriend tasted a piece during the photographing session then straight up STOLE three of these packets. Bottom line: I personally didn’t mind the texture. LPD had just had dental work so I almost wonder if she would have responded better had she not just had her gums scraped to within an inch of their own life. Or then again, maybe she’s just a Slim Jim person. #Shrugs. I should note that I tried more than one bag of each of the flavors and the texture thing held through each tasting. The Teriyaki was softer and more yielding than the Smokehouse Original and the Cracked Pepper. The folks at Bariatric Choice say that this will change soon. After the change, the jerky will be available in either a six-count box of 1 oz. packets or a three-count box of 3 oz. packets. I’ll keep you posted on the price. Turkey Perky Jerky is $48 for a pack of 12 (2.2 oz. ), $45 with subscribe and save. So this product sits in between the two aforementioned, but pretty close to Perky Jerky. I actually have in my possession another product from Bariatric Choice, their pea protein chips. Like I said earlier, I’ll be reviewing those on Bariatric Foodie Live during the Pledge. I have about 5 other items sitting in my cart on Bariatric Choice that I want to try. I point that out because I’d probably buy these as an add-on. Bariatric Choice has free shipping for orders over $69 so I could totally see myself adding this product to my cart to get over that amount! So far as taste, I liked each of the flavors a lot, but I didn’t find them any more or less impressive than other jerkies I’ve tried. The protein count is good but, again, on par with most other jerkies (and lower than Ostrim), which also have the benefit of being available in my local store. Welp…that’s my two cents. What say you? To learn more about Bariatric Choice, visit their website. And tell them Nik sent ya!